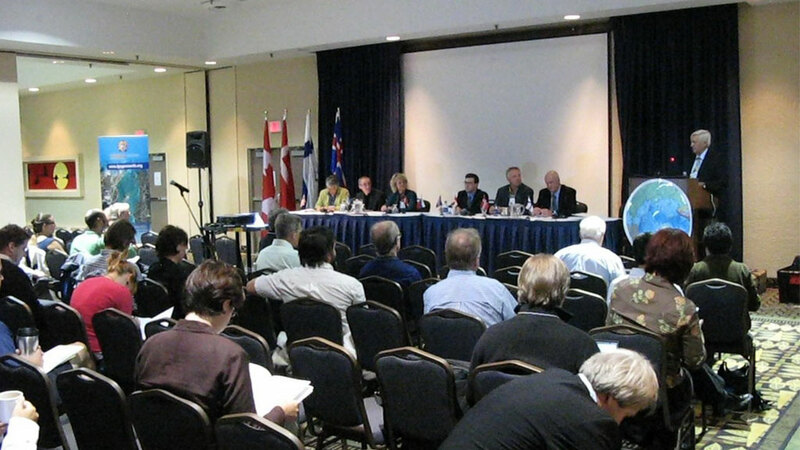 From August 20th to 24th, the IPY GeoNorth 2007 Conference took place in Yellowknife, Northwest Territories, Canada. The First International Circumpolar Conference on Geospatial Sciences and Applications, the main purpose of the conference was to discuss the planned Arctic Spatial Data Infrastructure (ASDI), which once in place would make it possible for all eight circumpolar Arctic nations (Russia, the United States, Canada, Denmark, Iceland, Norway, Sweden and Finland), as well as businesses operating in these regions, to share geospatial data. Paul Jolicoeur, who is Program Manager for the Geomatics for Northern Development program at Canada's Centre for Topographic Information in Sherbrooke, Qu&ecute;bec, and Chair of the Organisation Committee for the IPY GeoNorth 2007 Conference, recently spoke to SciencePoles about the highly successful conference and the first steps being taken towards the establishment of an ASDI. What was so unique about the IPY GeoNorth 2007 Conference? This was the first international circumpolar conference ever held on geospatial science and its applications. Initiated by NRCan and co-led by NRCan, the Canadian Institute of Geomatics and the Northwest Territory Centre for Geomatics, the conference was held up north in Yellowknife, Northwest Territorries, and was dedicated to the north and to the eight Arctic circumpolar countries. Overall, the conference was a huge success. It brought together close to 200 people from around the world. Even though about 75% of the participants were from Canada, it nonetheless had the ambiance of a truly international conference. Most of the participants were either people developing and offering geomatic products and services or people using them for their work in the north. One of the primary goals of this conference was of course to start discussion on building a common Arctic Spatial Data Infrastructure (ASDI) between these countries. The purpose of an ASDI would be to serve the needs of the north - not only researchers but also people living in northern communities who are facing incredible challenges with all the changes that are happening. We're not talking about just climate change but also changes being brought about by new development, new navigation routes in the north and things like that. A second goal of the conference was to get researchers from the circumpolar countries to share their expertise in building geospatial infrastructures, for example on how to use satellite imagery to better produce their maps and gather information on glaciers and other topographical features you find in the north. We wanted exchange of expertise between not only governments but also between governments and industries in the private sector that make use of geospatial data. The third goal was to make people of Northern Canada more aware of the potential of geomatics and how it can help them in their daily activities, in particular in the domain of sustainable development. We tried in particular to reach native peoples from northern communities in Canada. We have about 80 or more of these communities in the north, so we wanted representatives of these communities to come to the conference and to become more familiar with what geomatics can do for them and for their communities. Around 30 participants came from 18 remote northern communities spread across northern Canada. How many people in the Arctic regions currently use geospatial information in their daily lives? I can only really speak about Northern Canada. We have in total about 80 fairly large native communities in northern Canada, and probably about 30 or 40% of them are using geospatial data at this time to manage land use and development. For each community, there is a lot of geospatial information out there that can be useful to them. At the Territorial level (Yukon, Northwest Territories and Nunavut), they are all using quite a lot of geospatial information to do their job. What can northern communities do with the geospatial information gathered? They often use the more high resolution images to plan the development of their towns, so they can determine where to build houses or other structures, for example. At the departmental level they use larger-scale images for managing land use, monitoring caribou herds and their movement, providing navigation information to fishermen, resolving land claims, monitoring water resources, or making surveys for mineral or oil exploration. For example the Centre for Topographic Information in Ottawa has been involved in the last three years with Indian and Northern Affairs Canada and the government of the Northwest Territories in a major high-precision mapping project in the McKenzie Delta and Valley, where there's a potential pipeline project - a very big project (more then 10 billion Canadian dollars). The information produced will help the local population to find ways to minimise the impact of laying a pipeline in the delta and valley, and that way ensure a sustainable way to develop. Given the current geopolitical context within which ASDI would be set up, how much information would actually be shared between national governments? One of the goals of the conference was to discuss just that. Basically at this point what has been decided is to share knowledge of what could be made available in each country and start a discussion on what could become a common infrastructure. A source of inspiration for this has been the INSPIRE project in Europe. At the conference we talked about a basic geospatial infrastructure, which means sharing framework information. Framework information is what you find on a basic topographical map - hydrographic features such as lakes and rivers, altimetric features like elevation, ice-cap formation - all the basic topographical features you find in the north. Six of the eight Arctic countries were represented at the conference. Two countries, Russia and Iceland, did not send official delegations. There was a researcher from Russia who attended, but he didn't come as a representative of his country. All other countries had officials representing their country's mapping organisations. So you could say that Iceland was the only country not represented at all. I don't think it was due to political reasons. It was probably not on their plan of conferences for this year. A major item that will result from the conference is the Yellowknife Declaration, which basically will set out the intention to build an Arctic Spatial Data Infrastructure. Since this was the first conference to be held on such a topic, it was agreed that in two or three years a follow-up conference should be held. We have a proposition from the US that the conference be held in Anchorage, Alaska. It was also decided that a special group will be put together comprised of representatives from the Arctic circumpolar countries to help move along the agenda. A conference is a very nice thing to have, but it is only a starting point. We now need to have a group of specialists from each country to move this agenda forward. Will this project be funded uniquely through national governments? At the beginning, the project will be carried out through each country's mapping organisation. But if there's ever a need for special funding for trips and things like that, that will have to be discussed later. We haven't got to that level of detail yet. You also need a joint web portal, too, and that will be discussed in the future. In your opinion, what sort of obstacles do think might hamper the development of an ASDI? I think the will to have one is there, but each country doesn't have the same policy for sharing information, and that can be one major obstacle. In Canada we did not share freely the information we gathered until recently. Not long ago we were selling our data, and we had license restrictions as well. The different licensing policies between the countries will be one of the biggest challenges to overcome. We might encounter problems with individual governments sharing information with outside countries, but overall I don't think it will be a problem we can't solve. There may also be a few technical problems we'll have to deal with, but I don't see them being a significant obstacle. All countries probably don't use the same standards at this time, however a lot of countries are moving towards international standards like ISO and OGC now, so we don't think that this will be a problem in the long run either. Would you envision certain types of information as opposed to others being shared due to concerns over national security? I think that it will be easy to reach an agreement on what the framework information should be. Again we're talking about basic information, hydrographic features, altimetric features, ice-cap formation, etc. There should be no problem with sharing information like that. If you look at the INSIPRE project in Europe, they are already sharing this kind of information and it is readily available. For us in Canada, we share all the information we collect and anybody can have access to it. You just go on our web portal at Geogratis or Geobase and you can download the information. There may be some limitations at larger scales and probably also for some countries in certain areas. In Canada we don't foresee any major problems with collecting data. There may be areas where there will consistently be problems. I don't know in which areas that might be at this point. Perhaps images of military bases and things like that might pose a problem, but we haven't arrived at that point in our discussions yet. The discussions have really been about sharing information, and we really are at the first stages of those discussions. Once you put a group of specialists together form each country, they will probably have certain directions given to them from their national governments, and this is probably where we will face the majority of differences and challenges that need to be overcome. Once an ASDI is set up, how much of an impact would that have in monitoring the effects of climate change? That's a good question. It's very expensive to update information in the north. The more often you update, the better an indication of change you have. Obviously if you had such an infrastructure that each country could maintain it would be great, but in reality it will depend on the will of each country and the budget available. Budgets everywhere are being cut as well, so we'll have to deal with that issue, too. Just recently in Canada we had topographic coverage that was getting really old - between 40 to 50 years old in fact. Now this coverage is being updated with satellite data from 2002-2003 and we are currently in the process of acquiring another more precise and up-to-date data set, which will be accessible for free to everybody and used to update our topographic coverage. You can merge all of these data sets and they overlap perfectly. This way, it is easy to see the changes that are happening. There was a paper presented at the conference about just that, to show the level of change happening, if you compare aerial photography dating back 40 years and LANDSAT imagery dating back 5 years and now new Spot imagery that we are acquiring right now. So yes, having an Arctic Geospatial Data Infrastructure would have an obvious impact as far as monitoring climate change is concerned. In Canada it's having an impact right now. Specialists are using the information to detect changes that are happening. In order to have this on a pan-arctic scale you have to have a maintenance cycle and a global infrastructure, which hasn't been set up yet. Once this has been set up you'll also need to have the will and funding to maintain it, but we're still far from discussing that at this time. However the IPY GeoNorth conference has really set the stage to deal with these issues in the near future. If everything goes as anticipated, we should be able to report on the progress made at the next GeoNorth Conference in Anchorage, Alaska in 2009 or 2010. See you there! Paul Jolicoeur is Program Manager of the Geomatics for Northern Development program.